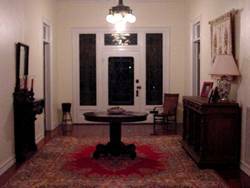 The Gus Cranz Mansion, Schulenburg, Texas. 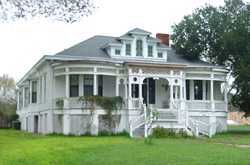 This house dates back to 1874 and is a prime example of the fine old-world craftsmanship that went into many 19th Century Central Texas homes. The newly-arrived "old world" carpenters, hadn't yet adapted the "new world" custom of cutting corners. They modeled this residence after the elaborate detail-rich homes they had built for the upper-classes back in Austria. Located on high ground just a stone's throw from downtown Schulenburg, the elaborate gingerbread and beveled glass windows are just a few of the details that justify its title of mansion. Inside, details are more pronounced. The house has retained its original lighting fixtures, which includes the exquisite cut-glass chandelier in the dramatic 50-foot entrance hall. Stained woodwork reflects the light; bathing everything in a soft 19th-Century glow. A chandelier from the former Shamrock Hotel ballroom lights one room while the kitchen remains casual and comfortable - like a Fayette County farmhouse with stained glass details. Gus Cranz, the man who contracted the building eventually moved from Schulenburg but the house has had few owners throughout its long history, including Doctor Schultz, the town's GP who was famous for having delivered nearly every baby in Schulenburg. Dr. Schultz, who had worked with Schweitzer in Africa and who went to Vietnam long before the war - used to see his patients right there in his downstairs office. 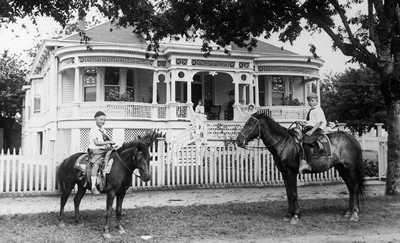 The photo above shows the two sons of Gus Cranz, riding their ponies on the sidewalks of Schulenburg. Other than the removal of the old fence and the modernization of plumbing and wiring, the house today is virtually identical to the one in this photo. In Texas, the concept of a B & B has gotten a little distorted over the years. 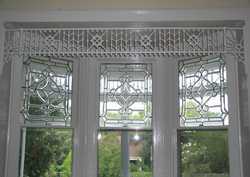 Owners have been known to take every possible measure to cut costs and horror stories are all too common. 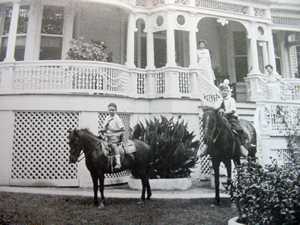 At the Gus Cranz Mansion, host Roy Saffel, who has extensive firsthand knowledge of many of Texas' best hostelries, has taken extra steps to insure that guests get an authentic taste of this unique Texas region. This includes the selection of fresh-baked Kolaches from the bakery downtown. Juices, waters and other beverages are well-stocked. A voracious reader, Roy has even stocked a library. Pick up a book to read - get involved. If you're a slow reader, Roy might give you a break on weekly rates. Buying a farmhouse and calling it a B & B doesn't make it so. If one is merely "passing through" a town, then a highway hotel will provide basic lodging. 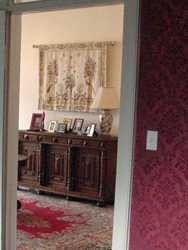 If, however, the traveler is looking to capture the history and the charm of a region, or a group is looking to have a celebration or business meeting in a calm and serene environment, then one shouldn't settle for one of those instant "Johnny-come-lately" B & Bs. The Gus Cranz Mansion is suitable for anything from a Honeymoon to a romantic spot for a marriage proposal. Roy has, however, drawn the line at divorces. 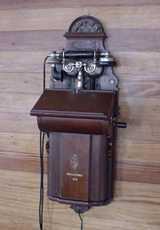 A period phone is still in working condition. Guests have ranged from nostalgic Schulenburgers, European visitors and an entire girl's softball team that now visits annually. Equidistant from San Antonio and Houston, it's the perfect place to stay to explore the understated charm of La Grange, Hallettsville, and Columbus.